Today I have a yummy dessert recipe for you that's gluten-free, egg-free and dairy-free. These Raspberry Crumble Bars are quite soft, even after they've cooled, so you might want to freeze individual portions if you're planning to serve them in a lunchbox. With a little bit of cinnamon (and a lot of sugar) in the topping, these little bars pack a great flavor punch -- use demerara sugar or maple sugar if you're avoiding white sugar. In a small bowl, combine flax seed and milk, and let sit for 3 minutes. Mix together the coconut oil and sugar in a medium bowl, then add vanilla and flax mixture. In a large bowl, combine two flours, 1 cup oats, salt and baking powder. Add sugar mixture to flour mixture and blend well. Divide this batter in about half (60/40 will work). Press the larger "half" into the bottom of an 8"x8" baking pan. This will be your crust. Spread the jelly on top of the crust. To the smaller "half" of the batter, add the additional oats, sugar and cinnamon. Crumble over the top of the jelly. 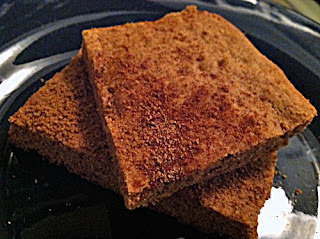 Bake for 25 minutes at 350 degrees F.
At our last link party, way back before Christmas, The Humbled Homemaker shared a recipe for allergen-free graham crackers, and I'm featuring it today so you can all have a chance to enjoy it! These crackers are gluten-free, dairy-free and egg-free, and if your kids are anything like mine, they'll appreciate the fact that you're not making them eat boxed GF crackers (my middle son won't touch them). Now onto today's link party. What did you pack for lunch this week? Shared with Fusion Friday at Jane Deere and Anything Goes at Bacon Time and Inspiration Friday At The Picket Fence and Friday Food at MomTrends and Weekend Bloggy Reading at Serenity Now and Thursday's Treasures at Recipes for My Boys and Pennywise Platter at the Nourishing Gourmet and Tea Party Tuesday at Sweetology and the Homestead Barn Hop at the Prairie Homestead and Melt in Your Mouth Monday at Make Ahead Meals for Busy Moms and Market Yourself Monday at Sumo's Sweet Stuff and Tuesday Time Out at Reasons to Skip the Housework and Anti-Procrastination Tuesday at New Nostalgia and Crazy Sweet Tuesday at Crazy for Crust and Tuesday Talent Show at Chef in Training and Tasty Tuesday at Naptime Creations and Totally Tasty Tuesday at Mandy's Recipe Box. Those raspberry bars look dee-lish!! Yum! Thanks so much for sharing on Friday Food at Momtrends. I adore these homemade treats--what a great way to show the kids your love. Have a great weekend. Those raspberry crumble bars look lovely - I linked my black bean & roasted vegetable salad this week because it's even nice cold so it would nicely fit in with your theme. Happy New Year and thank you for hosting! Thanks for hosting. I'm sharing a recipe for carrot millet muffins. They have such a delightful crunch from the millet. Very fun idea! I just added my Kale Chips :-) Thanks for visiting my site! Crumble bar looks delicious!! I linked 'carot Rice' this time....Wish you a Happy New Year!! The rasberry bars look divine! I shared my Dairy-Free Vanilla Toffee Ice Cream recipe this week. Thanks for inviting me to your party!!! I've sent the recipe I made up for sushi. We substituted brown rice for white and maple syrup for white sugar. These got eaten up in no time flat for our New Year's Eve Party. Enjoy!!! This look sooo Good! I can't wait to make them for my boys. Thank you for sharing on Thursday's Treasures. <3 and hUgs! Those look really good! My daughter would love them. Thanks for sharing on Crazy Sweet Tuesday! WOW! You have the best shares...I think these look so rich and delish - so glad to see you this week with this great recipe.